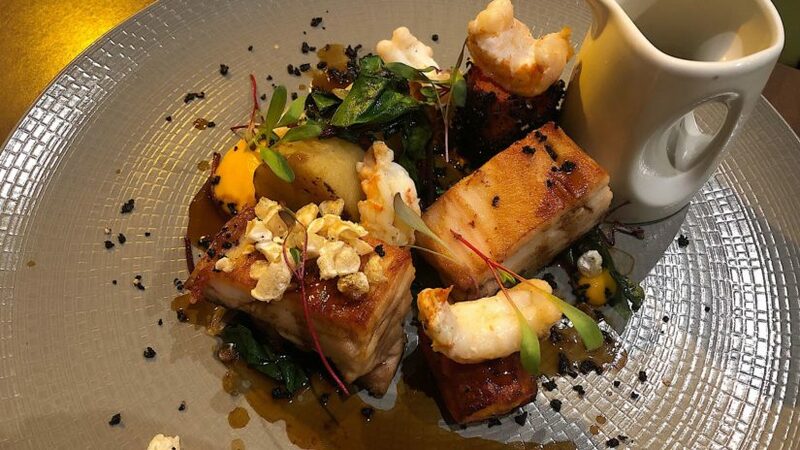 The Aberdeen Restaurant Week menu at Molly’s Bistro, which is part of the Douglas Hotel, offers refined dining at bargain prices. I visited with my partner in the middle of the week when the eatery was quiet and intimate. We were greeted enthusiastically by assistant manager Chris, who, along with the rest of the staff, couldn’t have been more attentive during the meal. Our table was on the slightly higher level of the contemporary, luxuriously-furnished dining room, giving us an unrestricted view. 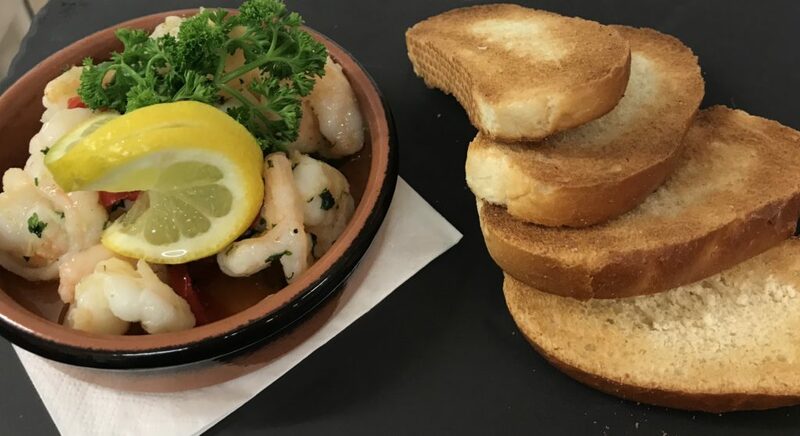 To start, we’d selected the garlic chilli king prawns served with toasted bruschetta and salad garnish and the duck liver pate with plum chutney, Scottish oatcakes and salad garnish. The prawns were soft, with a slight heat from Thai spices, and were delicious atop the slightly sweet, crunchy bread. 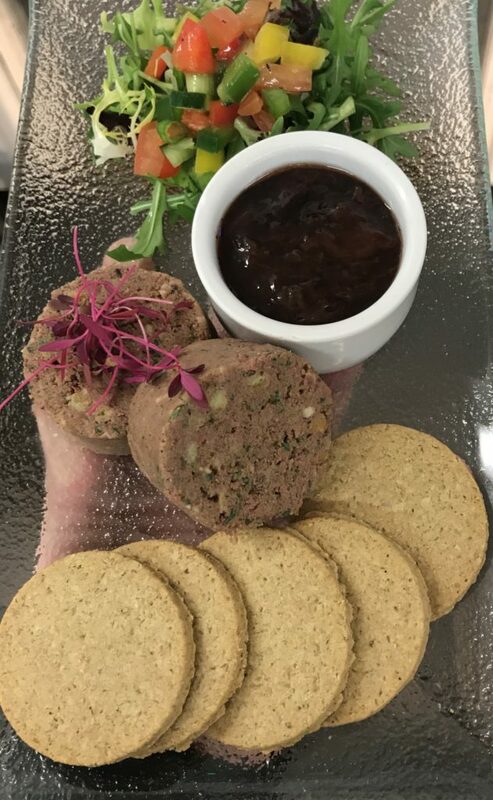 There was a fruity flavour to the pate, which worked well, even with the plum chutney alongside it. Both the pate and oatcakes were abundant. 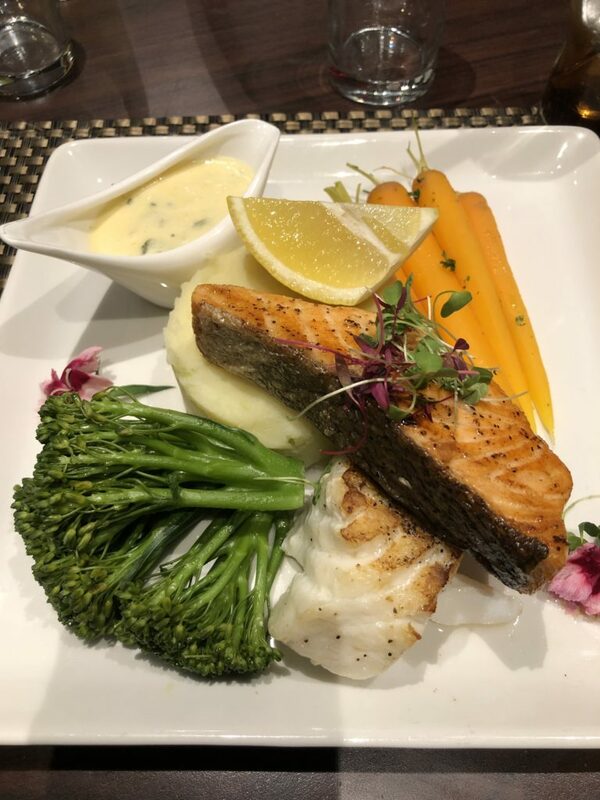 For our main courses, we selected the duo of fish, which was salmon and cod with spring onion mash, tenderstem broccoli, baby carrot and a spinach and lemon sauce. 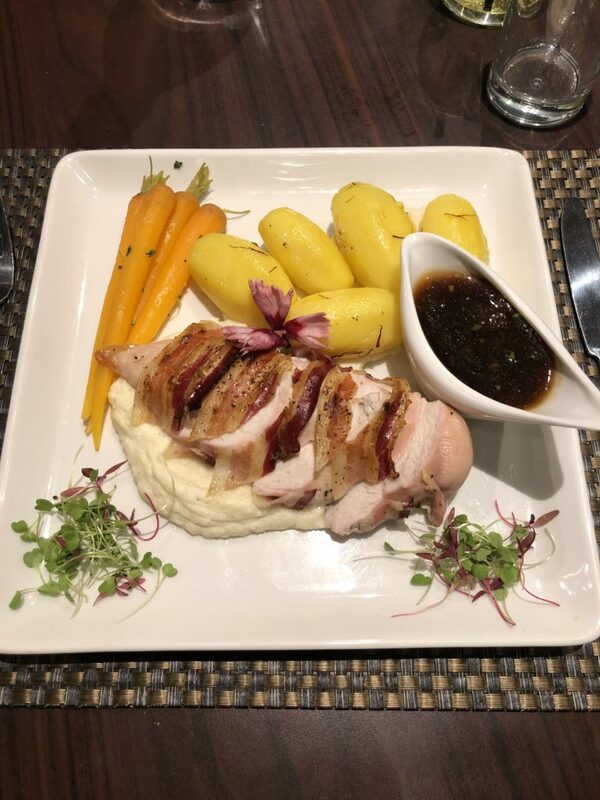 The other main was pancetta-wrapped chicked, saffron potatoes, cauliflower puree and a tarragon jus. My fish was more seafood cooked to a tee. Both the cod and salmon were moist and flavourful, with just the right amount of char on the skin to give texture. The creamy, citrus-infused sauce is tried and tested, as was the mash and crunchy veg. On this plate especially, the generosity of the portions was plain to see. 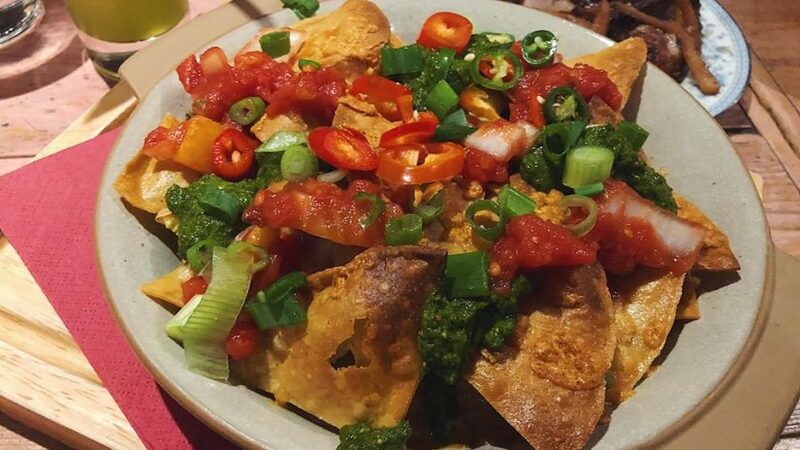 Despite adoring the dish, I struggled to finish – and I’m a big eater. My partner’s main course may divide some diners. 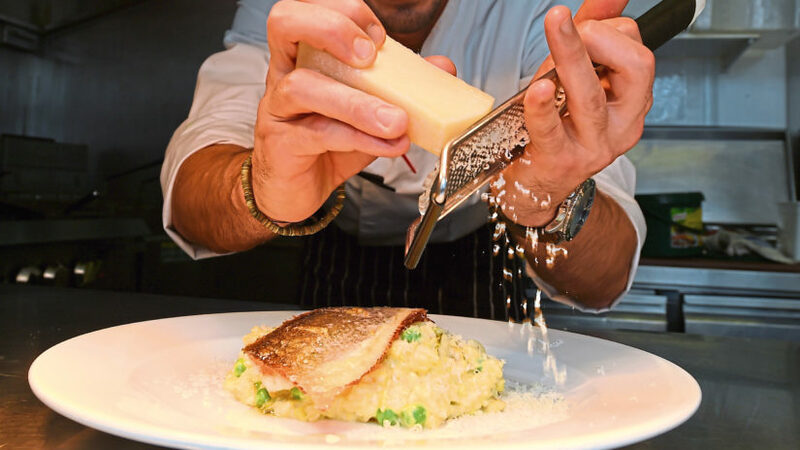 While the meat was, like the fish, cooked exquisitely, the saffron potatoes and tarragon jus are two bold flavours. They didn’t work together for me. To finish, we would both have had apple crumble, because it is a pudding which exists on a different plane. 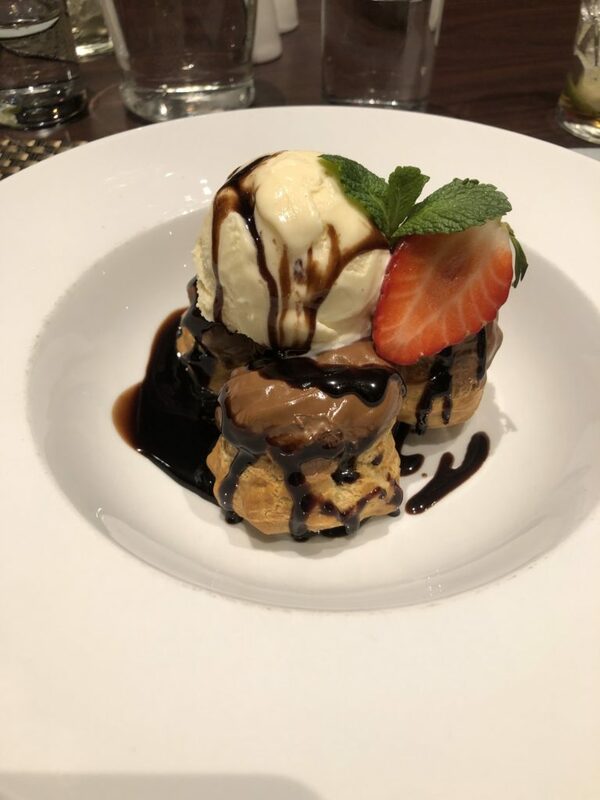 However, for the review’s sake, I took the not-at-all-painful hit and chose homemade profiteroles, warm chocolate sauce and vanilla ice cream. The pastry was sweet, well-filled with cream and the hot and cold combinations made for a decadent and delicious pudding. 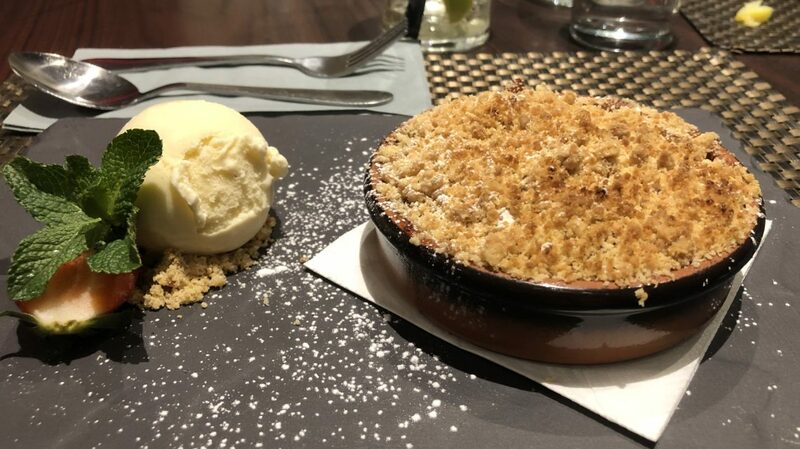 On the apple crumble front, you get the option of ice cream or custard. My other half chose the former. 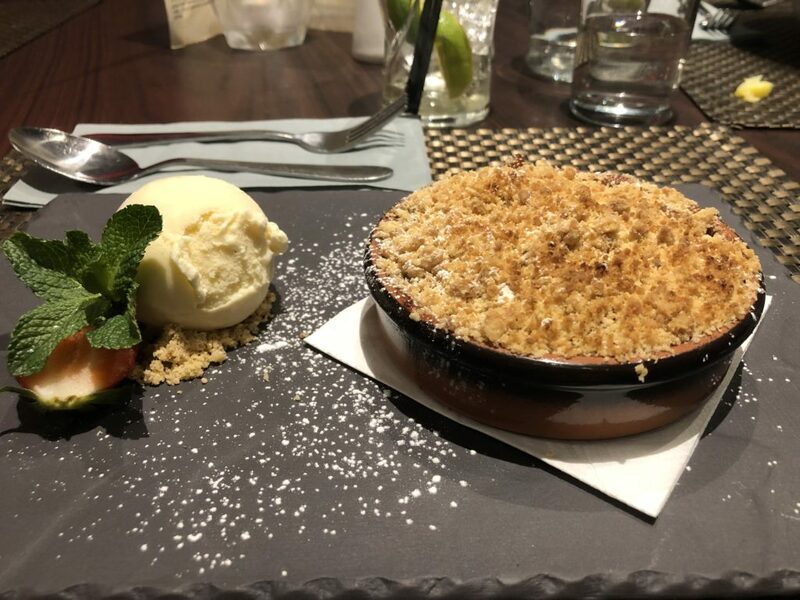 The hot and sticky winter spiced apples within the golden brown crumble were as expected – sublime on a freezing winter night. With its location within the hotel, hidden away down the bottom of Market Street, I’d just never entertained going to eat there. But seek it out – it’s friendly, modern and the food’s great.